The tested Baader planetarium filter (ref. 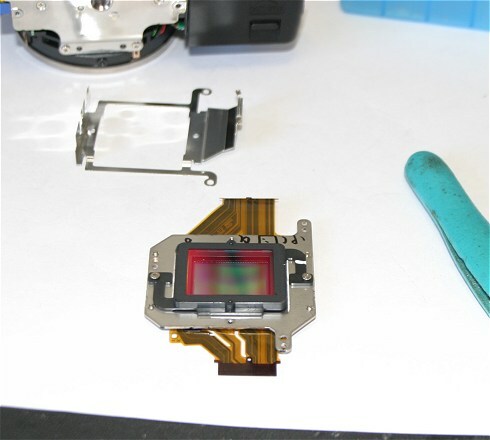 #245 9211) is a replacement of the original IR cutoff Canon filter for improve red response of Digital SLR (Canon EOS 300D / 350D / 20D / 30D familly). Left the Baader filter, right the original Canon filter. Note the smallest size of the Baader filter and the difference of optical transmission. 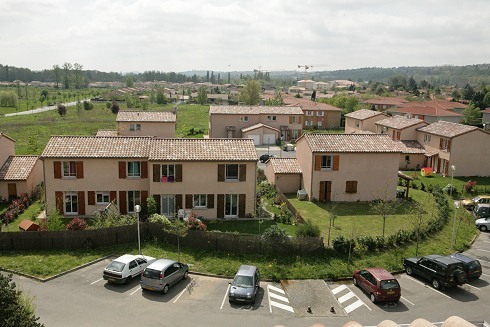 Replacement of the filter (photo Raymond David - Essentiel Electronique). The Baader filter transmit very well Halpha line and the deep-red up to 690 nanometers. 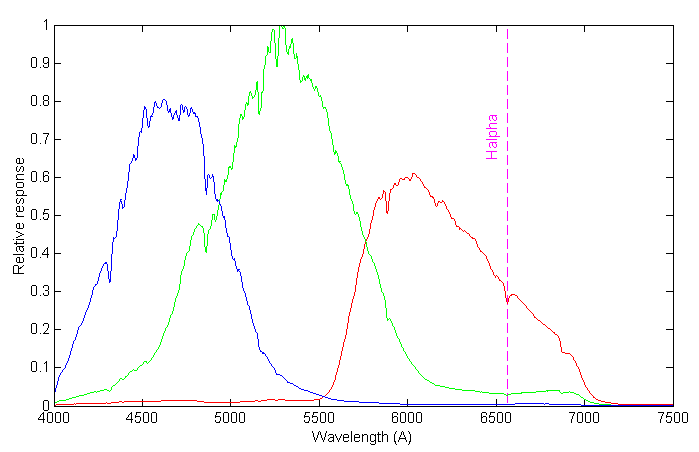 It is a very good news for the observation of the hydrogen red line in nebulae, for spectroscopy activities (access to the HeI 6678 A for example), and for global detectivity of a modified DSLR. 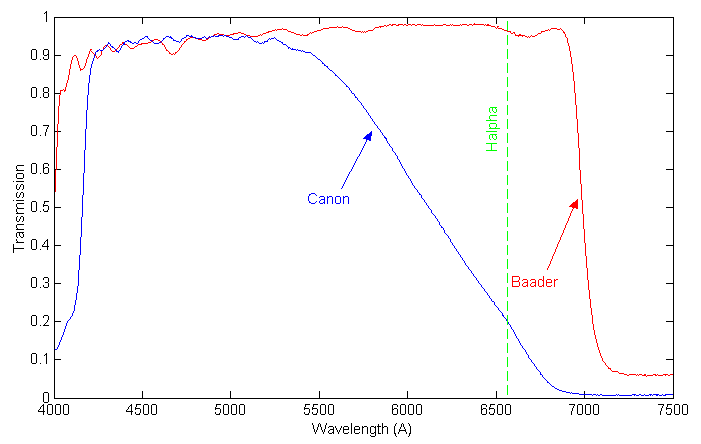 Some absorptions are noted with the Baader filter in the UV part of the spectrum, but less severely compared to the Canon filter (unfortunately H&K Calcium lines are inaccessible with the Baader filter in place). 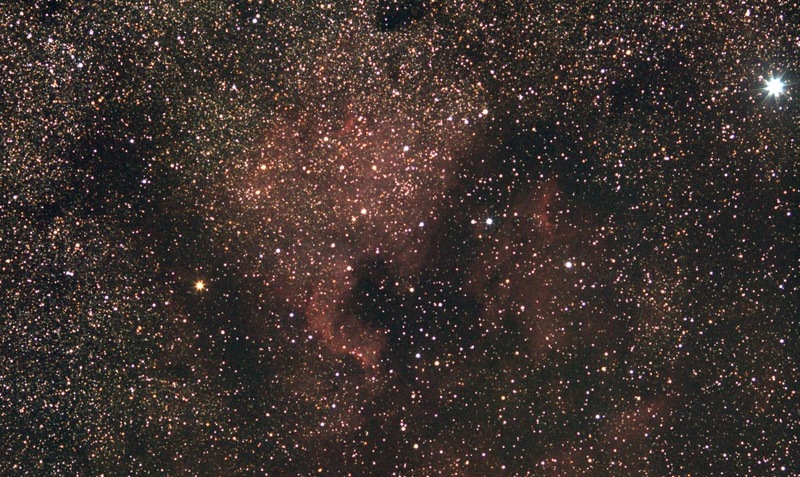 The standard Canon filter cut the deep red end of the visible spectrum. This greatly reduce response of the camera to a scientifically important part of the visible and IR spectrum, and the global responsivity. 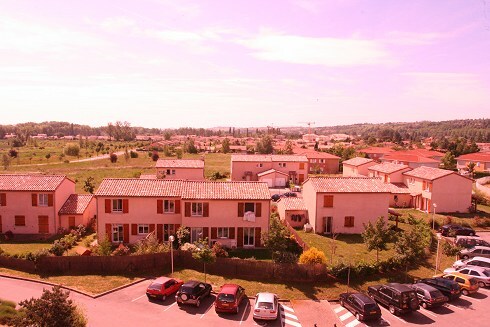 Some difficulties appear if the Baader filter is used for domestic infrared imagery (a marginal application) - see the two following images. 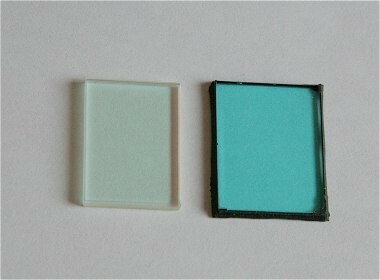 It is not easy for the moment to say if the bright left halo is related to the homogeneity of the blocking dichroic, or if it is caused by the small size of the filter and a positioning problem at the assembly stage ? 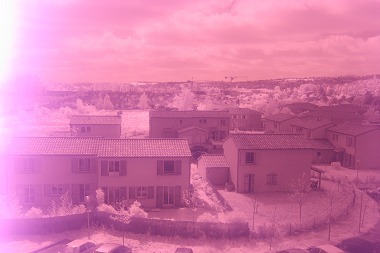 Infrared image with a 350D without IR blocking and through a W87 filter (1/60 s, f/22, 400 ISO). 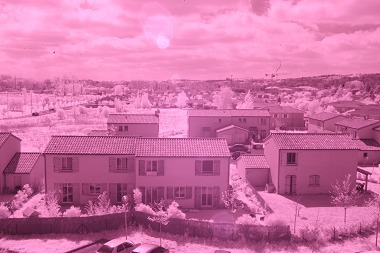 Infrared image with a 350D with the Baader filter through a W87 filter (1/2 s, f/7.1, 400 ISO). One can note that at the level of the Ha line, in addition to the response of the red channel, red light is also detected with the pixels of the green channel, and very slightly with the pixels of blue channel. At 656 nm, if the responsivity is 100% in the red channel, it is 9% in the green channel and 2% in the blue channel. Modified DSLR with the Baader IR rejection filter. 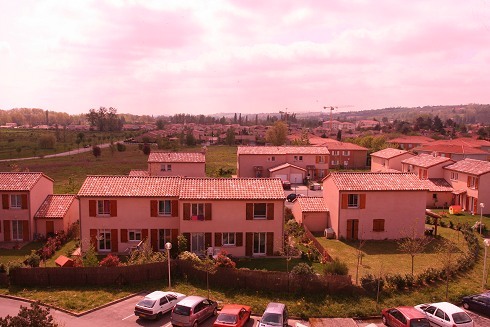 Without surprise, in automatic mode, the white balance carried out by the internal firmware of the DSRL gives a red image with the Baader filter. Modified 350D. Day light balance. JPEG image. Modified 350D. After manual white balancing on a white screen. JPEG image. 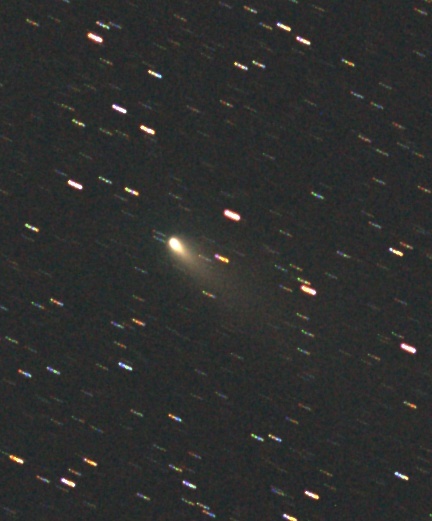 For comparison, a EOD 5D image. 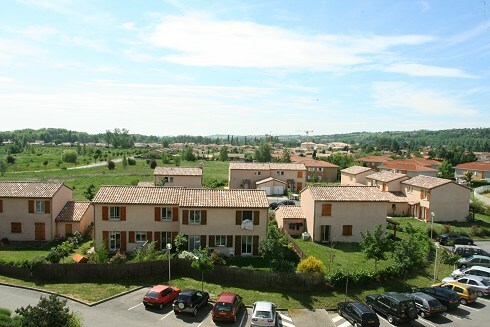 JPEG without applying of white balance (the reddening is caused by the firmware). The same image corrected with the coefficients R=0.73, G=1.00, B=0.88. At the price of a little effort, a modified DSRL with the Baader filter seems to be usable for domestic photography (the manual balance is valuable). 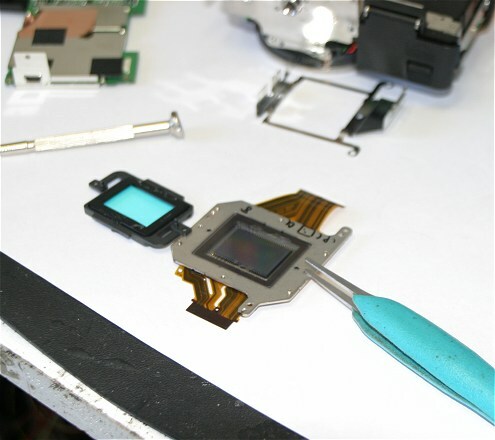 Note that if the autofocus is operational, good photographic optics, well corrected of chromatic aberration, are necessary. Note also the comment at the end of the page about the potential aliasing problem. Remember, the first application of the modification is the astronomical observation! The image below was carried out on April 23, 2006. A modified EOS 350D with the Baader filter is uded. The DSRL is equipped with a Canon objective 135 mm f:2L at f/2.8. The total exposure time is 18 X 2 minutes. The sky was particularly polluted by urban lighting (naked eye magnitude limits 2.5, click here for display one of the 18 unprocessed images of the sequence!). NGC 7000. 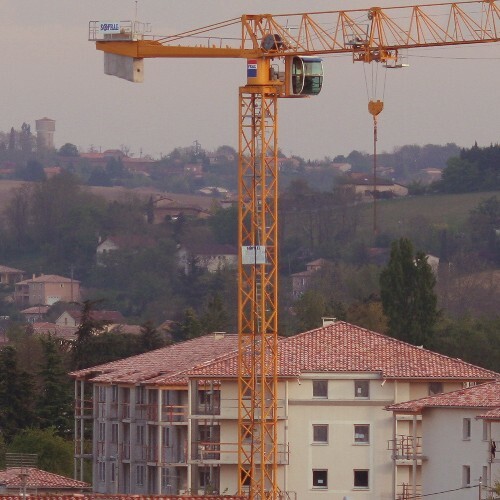 Portion of the original image, with a scale factor of 0.5. Click here for display this crop at the original scale. 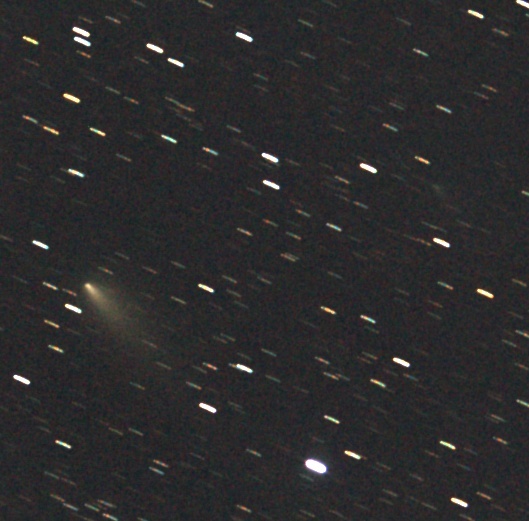 Image of the fragments of the comet 73P/Schwassmann-Wachmann on 23 April 2006 observed with a modified EOS 350D, as described in this page. Optics is a Canon 135 mm used at f/2.8. Mosaic of two images. 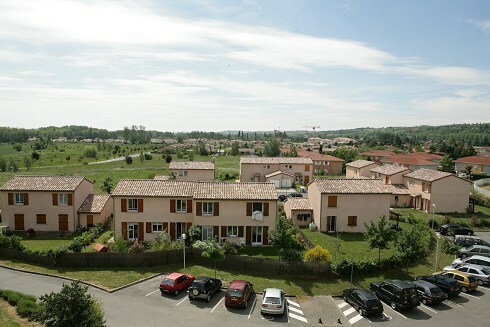 The exposure time is 18x2 minutes under a polluted sky (near Toulouse, France). Identification of the fragments of 73P. 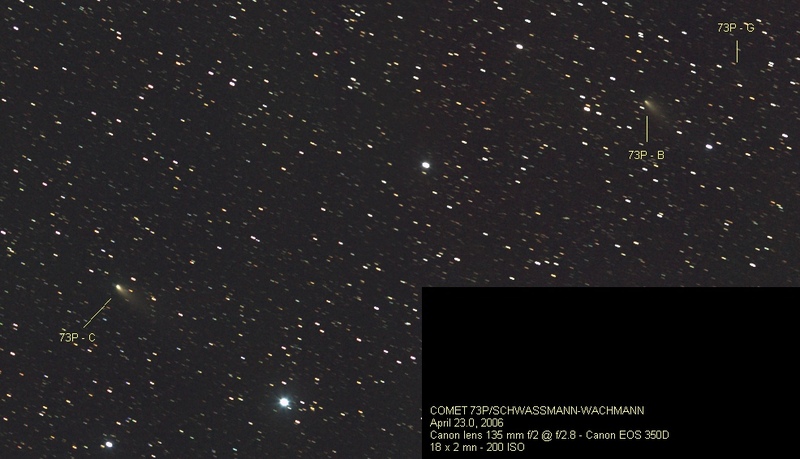 Details of the image of comet 73P/Schwassmann-Wachmann (original scale). Note the weak fragment G near the upper right corner of the right image. The original Canon minimize also color aliasing by soften optically the image before it’s recorded by the sensor. So, with the original low-pass Canon anti-IR / anti-aliasing in-place you lost a little sharpness. The side effect: If you replace the original filter by a filter without anti-aliasing capabilities (it's the case for the Baader filter), the image is sharpened, but also a risk appear of color artifacts with high quality optics and/or short focal length lens. The ways of reducing this effect is to apply a dithering procedure during acquisition (change slightly the line of sight between successives exposures). The typical random depointing of the telescope is equivalent to some pixels. For example, the "L" lens Canon 135 mm f/2 is a sharp optics. The FWHM of a star image is nearly equivalent to the pixel size (FWHM = Full Width at Half Maximum). On an individual image, if a natural red star drop on a bleu pixel of the Bayer structure, the observed aspect of the star on the digital image is a pure blue object. The dithering is really the key solution for suppress false colors defaults (see the example below). 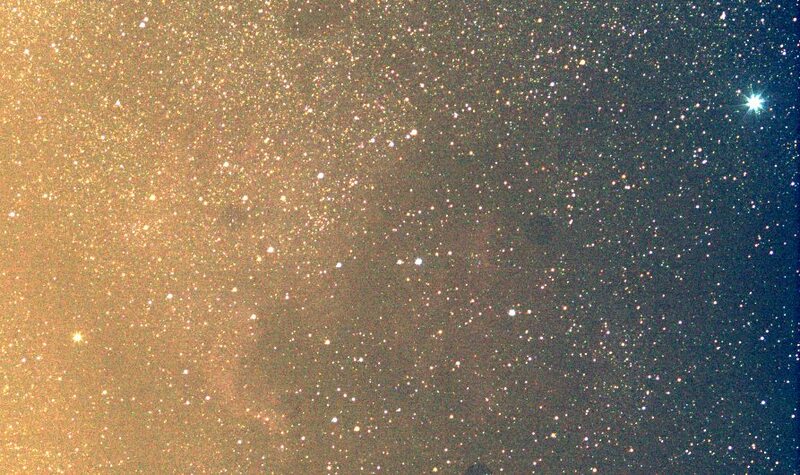 Crop of the NGC 7000 field. Single 120 s exposures. Original scale. Left, frame #1 of the sequence (note false colors for many point aspect stars). Middle, frame #2 of the sequence (the telescope pointing is not the same and the artifact are not the same also). Stack of 18 randomly dithered frames. 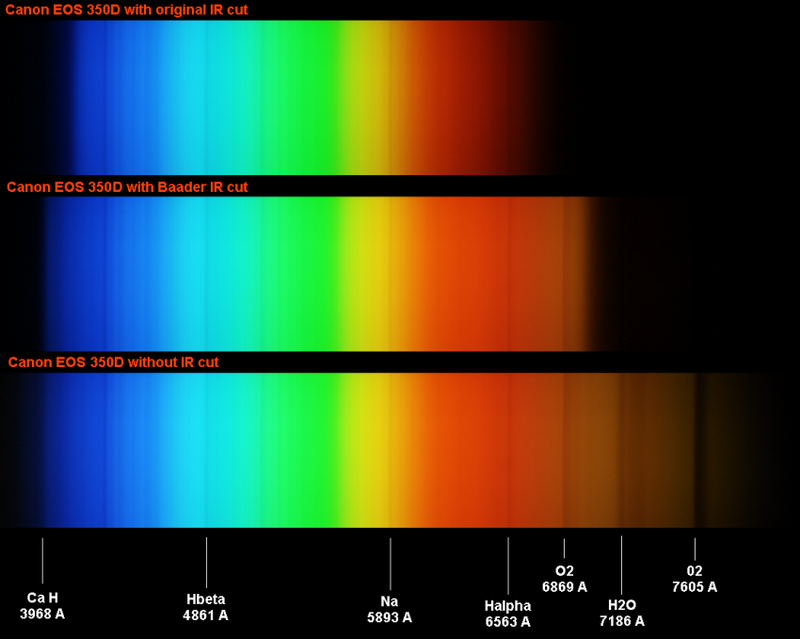 Now, the star colors are more representative of the real spectral types.